Gamers, save your game right now! For we have the most crucial weapon that can help you defeat any game! Now, we all know gaming gets intense. There's nothing worse than preparing yourself to score a vital goal, finishing off that end-of level boss or taking your friend down with a headshot, only to be on the receiving end because your finger slipped off the trigger! Well now you can literally get a grip in the heat of combat! Take a look at this amazing Trigger Treadz grips for Xbox One and PS4 controllers in a unique orange Special Ops Edition. With two different designs to suit every gamer’s play style out there; all terrain and combat rubber. Made from a hi-grade silicon rubber, these trigger grips include a grip for both your left and right controller triggers. 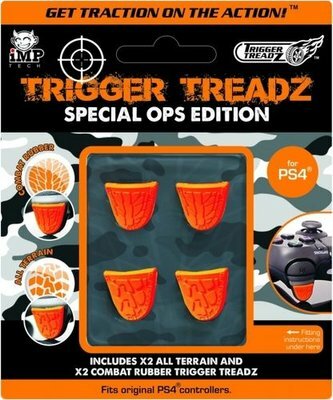 Trigger Treadz gives you improved grip on controller triggers enhancing gameplay. So the next time, when the going gets tough...get Trigger Treadz!